On April 16th, 1945, near the end of WWII, a small destroyer stationed just north of Okinawa, took a beating that would nickname the ship,"The ship that would not die." Laffey Men is a 30 minute documentary that shares the stories of 5 survivors of that morning in the pacific. Laffey Men screened at The Cleveland International Film Festival! 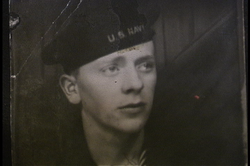 In 2004, I learned that my grandfather had been on a ship in WWII that went under attack by kamikazes. When I realized that most of the family knew as little as I did about it, I decided to make a short video to share with his 9 children, 37 grandchildren and 13 great-grandchildren. As I started to research the events that took place on April 16th, 1945 on board the USS Laffey, I was astonished and overwhelmed. I decided to take my camera, and my father, to the USS Laffey reunion in Patriot's Point, Charlseston, SC that year. Four other survivors were willing to share their experiences with me and I quickly had more information than I knew what to do with. Later that year, I interviewed my grandfather, who was still reluctant to share after 60 years, but in the end, provided our family with an amazing story of survival and bravery from our family's patriarch. With the talents of singer/songwriter Kari Newhouse, composer, Robert Safir and voice over artist Jeff McNeal, my short video turned into a 30 minute documentary. This story must be shared, it truly is amazing.